This weeks Maxi Cosi reporters task looks more at the performance of the new Maxi Cosi Loola. The task itself was for us to once again travel across town, picking a destination at the other side of the city documenting our journey and how the Loola copes with the different terrains. 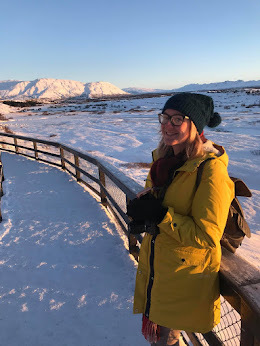 For this weeks task I chose to go somewhere totally different to where I would usually go, taking the car out into the beautiful countryside that surrounds our city and where I haven't actually been since I was a kid myself. I thought it would be a perfect place to go for a nice walk and really test out the Loola on a different terrain. 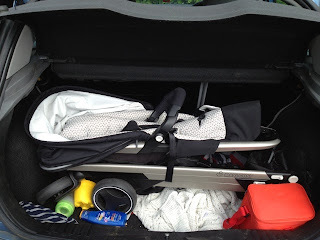 First of all we found it so easy to fold up the pushchair and stick it in the boot of the car. We didn't even have to remove the blankets, coats and beach toys out the boot from our trip to the seaside at the weekend. Of all the pushchairs we've had this one is the easiest to manouvre in and out of the boot of our little old Fiesta. We have plenty of room to fit bags of stuff around it if needed saving space inside the car free from clutter. We took a drive to the outskirts of Coventry to Baginton where we found a nice little pub with lots of parking and a kids outdoor play area which was the perfect place to stop before we started our walk. We sat in the sun with some cold drinks letting Gracie play whilst Zach watched her from his comfy seat in the Loola. When Gracie got bored we left Daddy sitting down while we took Zach to explore in a little field with long grass and rabbit holes. 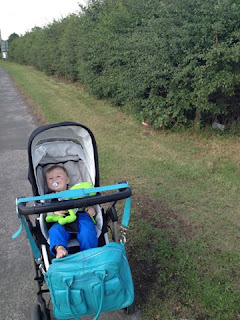 I struggled at first getting the pushchair over a small ditch into the field but once in the field we had a good walk around searching for animals in the grass (we didn't find any). The loola didn't struggle at all getting through the long grass or going over the bumpy uneven ground. Next we left the field and went in search of some horses although Gracie is terrified of them apparantly we were taking Zach to see them. We walked in the opposite direction to the pub along the country lanes on the small narrow footpaths. 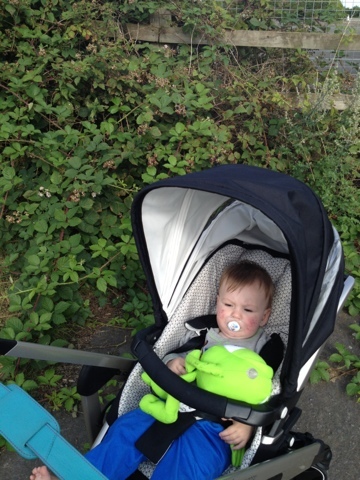 Again, the Loola was great for riding across the uneven ground from the neglected roads to the pedestrian walkways. 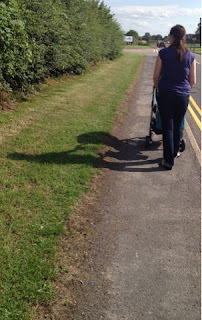 We eventually came to the end of the paths and decided to stop to avoid walking in the road with the kids. As we stopped we noticed a lady leaving a field riding a horse and she saw Gracie looked a bit scared so encouraged her over with Daddy nicely and she got right up close without crying! Apparantly he was scared of pushchairs though so Zach had to keep his distance but it meant not only did we complete our task of trying out the Loola on a totally different and unfamiliar terrain but we managed to get help with one of Gracie's biggest fears! I would say that this task has definitely been a success. 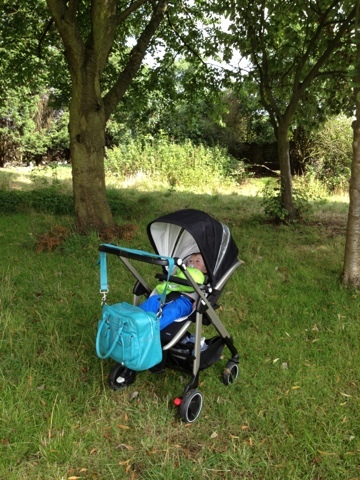 So now we know the Loola can tackle long grassy fields, uneven bumpy roads and narrow footpaths all with no problem. Oh and our trip to the beach sunday proved it wasn't too bad on the beach. Of course it was still not easy to drag along through the pebbles and sand but it was much easier than our previous pushchairs all I had to do was lock the front wheels to help keep it going in a straight-ish line. We were sent the Maxi Cosi Loola free of charge for the purpose of our reviews. All opinions are my own.